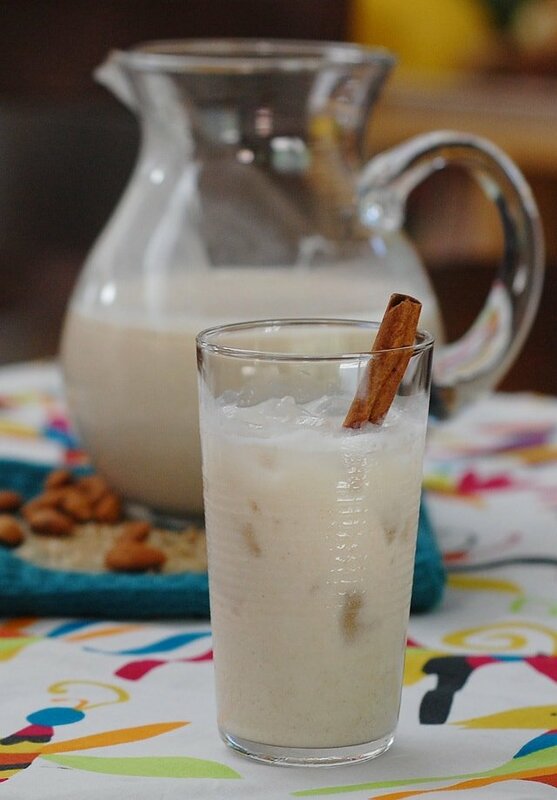 Home » Drinks and Syrups » Oat-chata from OATrageous Oatmeals! My first cookbook truly changed my life. I became vegetarian a few weeks before I got it and knew nothing about cooking. This was back in the 80’s when it wasn’t as easy to find quick substitutes or even vegetarian meals on every menu. I read The New Moosewood Cookbook like it was fiction, curled up in a chair reading into the middle of the night. I processed all the how-to’s and recipes over and over again until the words ‘diced’ and ‘simmer’ were etched into my head. I immersed myself into Mollie’s words, but it was all of her beautiful illustrations that really made all those new words become clear. Little by little I got confident enough to try a few recipes. While not everything turned out as planned – all of it got eaten. I made soups, stews, casseroles, and recipes that were from countries far away from Winston (Salem). I branched out to more cookbooks by Mollie Katzen, Nava Atlas, and any other vegetarian cookbook I could get my hands on. I made my first loaf of bread from Laurel’s Kitchen and then moved on to bagels. I cooked for all my friends and even made up a few of my own recipes by the time I was in grad school. I couldn’t have guessed that that one little copy of Moosewood would later turn into a new career. I never thought I’d have my own cookbook, much less would be starting on my fifth book now. I’m sure you all have a story about learning to cook, maybe even a favorite book that changed the course of your cooking and eating. Please leave me your story in the comments, I’d love to hear them. I wanted to share a recipe from my new cookbook, OATrageous Oatmeals. 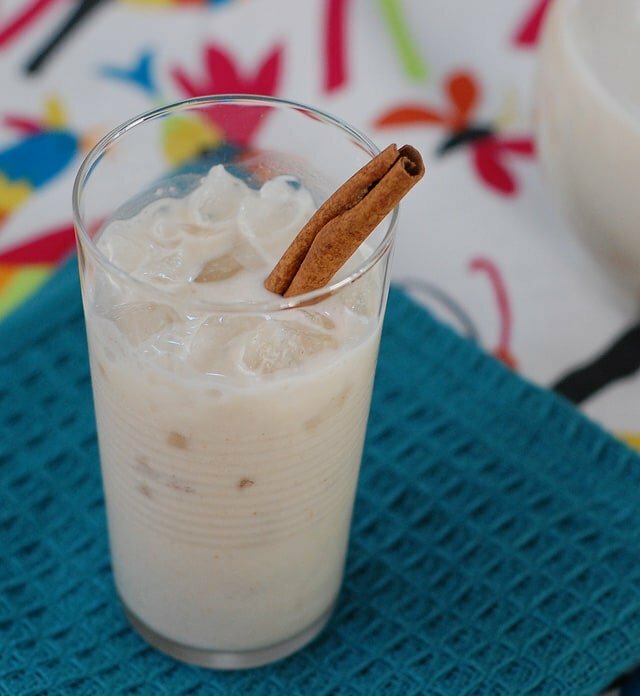 I love this Oat-chata, which is a horchata with an oaty twist. It’s great for breakfast or a cooling afternoon drink. You can even add a little rum and make it into an evening cocktail! gluten-free, soy-free, oil-free Horchata is a traditional Mexican beverage made with homemade rice milk, cinnamon and sweeteners. I’ve taken liberties with it here by adding in oats and almonds. It’s amazing served over ice and is the perfect drink for a hot summer day. I have to admit that I went through my first batch in a day—it is just that good. Consider yourself warned. Maybe go ahead and make a double batch. 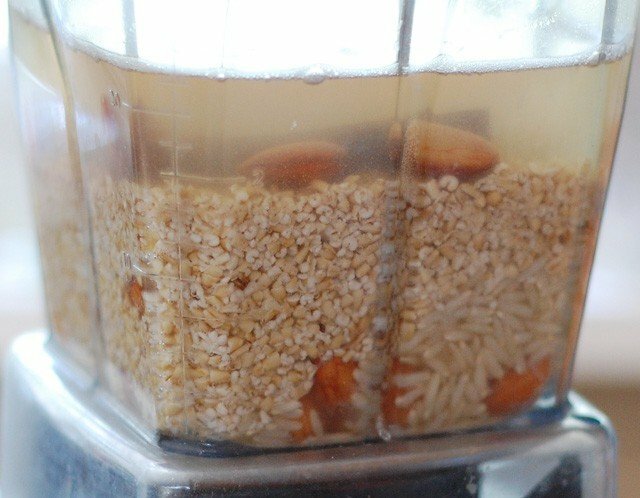 Put 2 cups (473 ml) of the water in a 4-cup (946-ml) sealable glass container along with the oats, almonds, rice and cinnamon. Soak overnight or between 8 to 24 hours. Strain through a small mesh strainer into a bowl with a pour spout. Rinse the blender and strainer. Strain the mixture a second time into the blender. Add the other 2 cups (473 ml) of the water, agave, vanilla and stevia and blend well. milk with a touch of your sweetener, then taste and add more if necessary. particles become soft. I like to eat it as a breakfast with a little sweetener – yum! « Delicious Jams and Chutneys You Need to Try! What an interesting recipe and your book full of oat goodness is so intriguing! I am so excited that your passion for cooking turned into a career for you – such a great job and such a fun and delicious one!! You are so sweet and have been a huge support to me! I know with as much as I love the Vanilla Nut Creamer from OATrageous that I will love the Oat-chata. I’m already a fan of the regular horchata! And I have a copy of Moosewood, too. Love it. This sentence kills me: “I made soups, stews, casseroles and recipes that were from countries far away from Winston-Salem.” Hee! I lived a sheltered life growing up! so many cookbooks have! I will list viva vegan because it helped me make my own corn tortillas which are amazing. I need to try making my own. I even got a press recently! Kathy, This looks delicious! Thank you for the double-batch suggestion – and for making vegan recommendations for the recipes, too! I love horchata, & this sounds great. Can’t wait to see your new book! Looks delicious! I’m not familiar with horchata but will be trying it soon on a hot day. Thank you! Cant wait to read and try recipes from your new book!! Oatmeal and cocktails are two of my favorite things! Thanks for the awesome giveaway! 1. I’m not a vegetarian, but I also love the Moosewood cookbooks. It’s my kind of food. 2. I’m making this recipe this weekend. And hunting down a copy of your book. Adding oats to horchata is just brilliant! Thank you! The book comes out September. If you pre-order it be sure to send your receipt to the email in the post to get some goodies. When I was young my grandma would let me in the kitchen to help her cook. I remember she had this delicious meatballs and I asked her to give me the recipe. She did and for some reason that made me love cooking. I love horchata! I bet oatchata is even richer! What a great drink, Kathy! Love the flavors and I know I would feel virtuous drinking it as well. I am also appreciative of your tips on making the other recipes vegan. Both daughters are vegetarian 99 percent of the time so I am always on the lookout for tasty recipes for them and I am interesting in learning more about reasonable substitutions, whether vegan or vegetarian. This is a good way to sneak in some rice to the recipe. I’m not that fond of rice but it’s a good gluten free sub and this is a great recipe to use with it. Rather than a cookbook, I fell in love with cooking by watching Emril Live as a kid. From Emril, I learned all the basics…sautéing, knife skills, etc… And this ‘oat’chata looks pretty amazing! Is there a substitute for the stevia (like an equivalent amount of sugar/agave/something else)? I find that stevia leaves a bitter taste in my mouth. Thanks for the give away! Looking forward to checking out your new cook book! The cookbook that got me into cooking was La Dolce Vegan, I remember picking it up while on vacation with my family (over 10 years ago)! We drink LOTS of horchata in our house, and I’m so intrigued by your addition of oats! I’ll definitely be trying this. Plus, I can’t wait for the book – steel cut oats are one of my favorite foods. The recipe looks very good. I have never tried anything like it. I’ve tried horchata before and loved it, so I think this recipe would taste amazing! Bittman’s How to Cook Everything changed the way I felt about cooking. I love how his recipes are specific but also so open to experimentation. I love all your books! The great bean is my favorite or most often used! The first cookbook that got me excited to cook was bought in 9th grade and is: The Essential Vegetarian Cookbook by whitecap books. p.s. I’m not usually one to pre-order cookbooks; I prefer to borrow from the library or browse at a store before making a decision to purchase – I have so many already! But I must admit to being really tempted by this one. I rambled through the table of contents on Amazon and everything looks SO GOOD. Really tempted – I love horchata so this might be tasty too! The Moosewood Cookbook really enchanted and inspired me back when I first went veg. I think I would like to try this without oats first. It sounds delicious!